Looking for home decor tips to refresh your dining room or kitchen? One of the possible variants can be trendy rectangular dining table that will perfectly blend in with other interior items. Why rectangular tables? It is because compared to their fellow rounded tables, rectangular tables manage to accommodate a higher number of guests and also provide greater flexibility when it comes to adapt to multi-functional uses and contract settings, and also to fulfill different needs. Metropolitan dining table is a mix of minimalism, contemporary taste, and metropolitan twist, built on clean geometries and rationalist design, with essential lines being successfully turned into a bold authorial mark. This rectangular table is tightly linked to the architectural world and plays with unexpected combinations of forms and materials for the most surprising and versatile of effects. Celebrating the natural beauty of oak, the Slab table is a piece constructed in angular forms of inviting simplicity. The surface is deeply brushed to expose the grain and finished with either a black or natural lacquer. Perfect execution, skilled wood junctions, simple and elegant, unique design, Piana can be defined more as an icon in the furniture world, than a mere table. A must for anyone who seeks the best in design and the finest woodworking. Elegant and timeless, Ritz is the perfect union between strength and lightness, thanks to the skillful game of solids and voids, wood and glass. This masterpiece of design fits perfectly in any environment, classic or contemporary. A simple style, elegant and timeless, drove the design of this table, suiting the needs of a very demanding public, lovers of wood and its skillful workmanship. The Luxury extending dining table has a wood top and self-storing wooden extension leaves. This dining table features scalloped chromed steel legs. Koi carp is a recurring symbol of Japanese culture. Its natural color mutations reveal their capacity to adapt, just like KOI Dining Table. Featuring a base in aged brass and a top in acrylic, this rectangular dining table will add refined elegance to any dining room design. What do you think about this article? Please, leave your comment below. 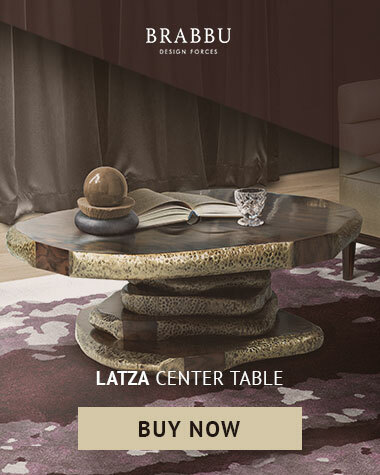 If you want to be up to date with the best news about trends, and luxury furniture brands, you must follow us and keep on hold of the latest and the most exclusive Modern Tables. Follow our Pinterest for more inspirations!